You may have seen it on television, read about it, heard it on radio or even seen it in your own community. A crowd of very angry people would beat up a person who is suspected of committing a crime. The crowd would use anything from their bare hands to shamboks, sticks, and even stones. 'We want to teach him a lesson', they would say. 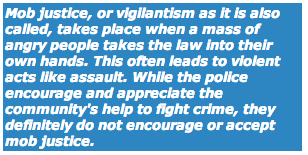 Mob justice is also called "vigilantism." It means taking the law into one's own hands. A person is a vigilante if he or she is a member of a group trying to enforce the law without the right to do so. South Africa is a democratic country where everybody's rights are guaranteed in the Constitution. This country also has law enforcement agencies to perform these functions. Acts of mob violence could lead to the mob committing other crimes like assault, public violence, intimidation and even murder. Committing these crimes could lead to imprisonment and/or a fine. No matter how angry you are, you must not take the law into your own hands. Let the police and the courts of law deal with the suspect. There are other ways of joining the fight against crime. One of them is to join the Community Police Forums (CPF). 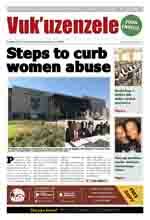 The CPFs is an opportunity for communities to work in partnership with the South African Police Service (SAPS). The partnership leads to better communication. While working together with the police, it becomes easier to see where the problems are and find solutions.